On Tuesday, Bahrain’s parliament has voted against a Royal Decree that increased the government’s debt limit by 40% four months ago. The matter will now be taken up by the National Assembly’s upper chamber and if it should vote against it, the decree will be retrospectively vetoed and considered void. The government failed to convince the parliament before the vote despite the central bank’s warning that failure to approve the decree could affect the country’s credit rating. The country’s debt ceiling was fixed at BD5 billion ($13.1 billion) but the royal decree increased it to BD7 billion. 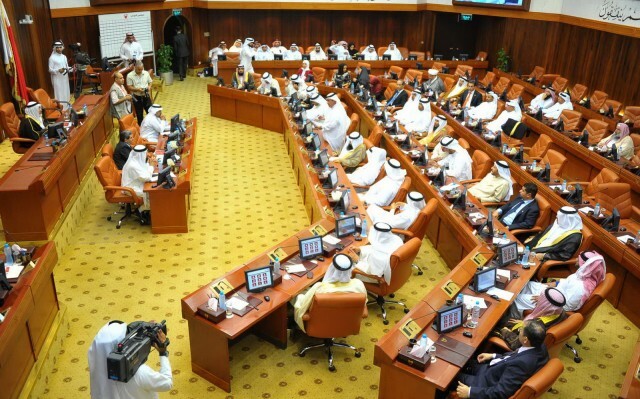 The lawmakers didn’t heed to the calls of the Parliament’s financial and economic affairs committee chairman Isa Al Kooheji for the postponement of the vote by a month in order to enable the government present its draft budget and to know if the debt increment was necessary. The committee recommended the decree’s rejection but changed its position during the weekend after meeting with government officials. The government has already borrowed more than BD5.6bn and if the decree is vetoed, it will be obliged to pay the surplus above BD5bn. The government’s two-year national budget for 2015 and 2016, which has still not been presented to parliament by the Cabinet, could also be reviewed. Al Kooheji said the added BD2 billion is aimed at funding social welfare schemes. Finance Minister Shaikh Ahmed was quoted explaining to the parliament that the debt increment can be justified after the budget presentation. “We will then (when the budget is presented) tell you about our six-year plan that will bring us level before we start addressing or tackling borrowing, which as everyone realises means three budget terms,” he said. Low oil prices are also affecting Bahrain’s income. Written by: Jaber Ali on March 26, 2015. Posted by Jaber Ali on Mar 26 2015. Filed under Finance, Headlines. You can follow any responses to this entry through the RSS 2.0. Both comments and pings are currently closed.